The New Year's resolutions you keep are those that become new habits. How do you create new habits? One of the best ways is to break down your larger goals – whether that's bettering your health, as it so often is after holiday binging, bettering yourself or bettering the world at large – into bite-sized mantras and rules. You're convinced that a vegetarian diet – or at least a diet with more vegetables than the one you eat today – is healthier for you and the planet, but despite the evidence, you can't get on board with such a big change in your diet. So just go meatless on Mondays. It's a growing nationwide trend with its own organization and Website. Eating vegetarian one day a week will give you the space you need to get comfortable with new vegetarian recipes, and before you know it, you'll be eating more vegetarian meals throughout the week. Why not start at home, with a DIY energy audit, which will help you identify how you're wasting energy so you can spend a future Tuesday weatherizing your home. If you're like us at The Daily Green, you love the idea of DIY creativity and self-sufficiency, but you struggle to find the time to start and complete new projects. The solution? Set aside a couple hours every week to give yourself the time to create. Whether you're making gifts, turning trash into crafts or hacking your home to boost its value and efficiency, the key ingredient of success is time. So much of life's anxieties – especially when it comes to goal-setting – is focused on what we're not doing well, and what we're not doing right. Take the time once a week to relax and appreciate what you have. Spend time with family or friends, write a letter – or reflect on all the progress you're making on those other resolutions. Did you know that three-quarters of Americans don't eat enough fruits and vegetables? At a minimum, U.S. health agencies recommend eating three servings of vegetables and two servings of fruit every day. Even if you are in the minority of Americans that achieves this goal, it can't hurt to diversify with new fruits and vegetables that have different phytonutrients. So make Fridays a day to try a new fruit or vegetable – and make it a fresh seasonal fruit or veggie whenever possible for the best flavor and nutritional profile. Start now by trying these recipes from the winter farmers' market. Most of us start the New Year with some sort of exercise goal – whether it's hitting the floor for some pushups, or the gym for a daily workout. But for those of us who have tried and failed to make exercise a part of our routines, a big problem is fatigue – not physical fatigue, but mental. The treadmill isn't any more exciting on Saturday than it was on Friday. So start an exercise regimen, or spice up your existing routine, with a regular workout outdoors. Whether it's biking on a new rail trail, hiking at a forest preserve or ice skating on a local pond, adding an element of exploration to your week will deepen your connection with the outdoors while improving your health – naturally. Generosity takes practice, just like anything else. Make good works a habit by doing one new good deed once a week. Maybe it's volunteering (or planning) a volunteer vacation, donating money (or even clothes or other items) or just lending a hand to a neighbor. 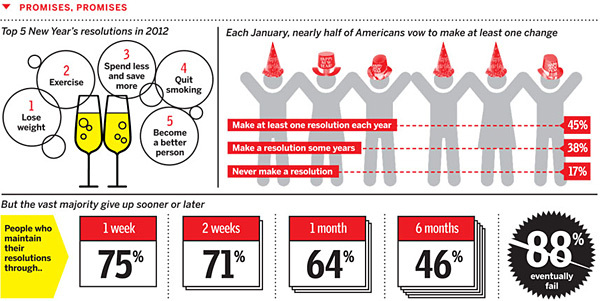 Whatever it is, you can make doing good a habit in 2013 by doing one good deed once a week.